First off, can you believe, we won another festival. 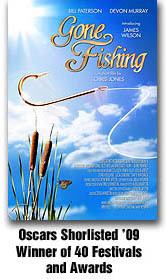 While in the Bahamas, Gone Fishing also won the Barbados Film Festival. I am waiting for the organisers to send me more details and hopefully some photos. What a day this was... just the perfect time for your DVD to arrive! 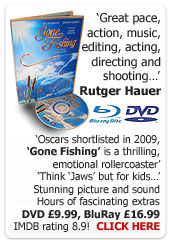 :) Excited I threw it right into my DVD player and got to watch "Gone Fishing" again before the football match. I'm not alone in being touched and inspired by your journey. Perhaps my personal story can put into perspective the extraordinary effect you are having on countless film-makers. Two years ago, whilst walking on a beach in South Wales, my daughter encouraged me to return to my first love..... making films. I was 47. As a teenager and student I had spent hours making super 8 short films and then arranging public screenings attended by hundreds. After graduating (in science) my first job was as an assistant to Martin Benson at his small film company in Radlett making corporate 16mm films. But I gave up early on the industry because of pay and what followed was a relatively successful career in marketing and advertising.... until that walk on the beach. It was your three books, especially your documentary one, and then the documentary weekend that led directly to me setting up my little company Jump Off The Screen with some initial successes and with some larger dreams. Thank you. And for the last 2 years I have constantly been helped by dipping into your incredibly sharing and generous blog. I've been a silent reader, not directly supportive I'm afraid, but having now watched Gone Fishing I wanted to pass on my massive congratulations to you for creating such a lovely viewing experience which I was able to share of course with my family. I so much wish you further success with it. This movie really inspired me on so many ways. As a filmmaker student and as a person I feel highly touched by the simplicity of this story and how Chris and the rest of the crew brought it together. The slow pace on the beginning and the heart-beating feelings that takes us on a journey until the end have really made me cry and wish it never end. It is like I know the characters for so long... And technically speaking I can say: Well Done Chris, Eddie, Vernon and Ivan the Ivanator!!!! You are THE GUYS!!!!!! Congratulations!!! I loved this movie and I can't wait to see your next one! Great movie! we all waiting for new one!!! This is an amazing film. The cinematography is stunning. But it goes way beyond that with a very touching story with all the elements of fine storytelling. I learned a lot as a filmmaker just watching its detail and perfection. I love that Chris has put so much effort into every aspect of the film; and I look forward to his next ones.